The Imamzadeh Hamzeh mausoleum, also known as Imamzadeh-ye Ali Ebn-e Hamze, is the tomb of the Emir Ali, one of the disciples of Imam Reza. 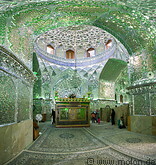 The current shrine lies in central Shiraz and was built in the 19th century after previous shrines had been destroyed by earthquakes. In the shrine there is an inner with tombstones, where people who payed large amounts of money were buried. The shrine building itself has a beautiful blue dome. The interior is decorated with a mosaic of mirrors, which are very impressive as you can see from the photos below.